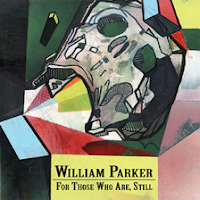 AUM Fidelity has presented us with a great gift by releasing this three-disc box set of four previously unreleased compositions by William Parker, all of which are essential listening for any regular reader of this blog. The pieces range from quartet performances to Parker's first composition for a symphony orchestra. It's a beautiful box, packaged in the same hand-crafted style as last year's Wood Flute Songs release. Since Mr. Parker requires no real introduction, let's jump right into the music. Disc 1 features two compositions, opening with the 28-minute meditative (but very active) For Fannie Lou Hamer. The namesake of this piece was was a civil rights leader, chairperson of the Mississippi Freedom Democratic Party, and an American hero; and it was performed in NYC by the Kitchen's house band way back in 2000. The words of William Parker are brought to life by vocalist Leena Conquest, whose recitations have the dramatic-but-plainspoken arc of Patti Smith's early work; while her melodic handling of the lyrics recall Nina Simone or Abbey Lincoln (but this has more to do with content than with the original style and sound of Conquest's voice itself). JD Parran and Sam Furnace are both credited with “various winds,” adding unique bursts of color and texture to the music in ways usually reserved for percussionists. It's hard to believe this work hasn't seen a release date until now, given the success of the end result. The nine relatively short song-form pieces that make up Vermeer, performed here by Parker & Conquest with pianist Eri Yamamoto and saxophonist Darryl Foster in a studio session from 2011, round up the first disc. I'm going to get my own bias out of the way now: I do not particularly care for the Trained Voice. I don't generally like vocalists who project outwardly. To me, it comes off as overly dramatic, overwrought, and ultimately false. But this is a personal bias; I'm not saying this style of singing doesn't work. It just doesn't work for me. Having confessed this, Conquest's vocals – which had been so central to the success of For Fannie Lou Hamer - on the self-titled opener continue to annoy me with their studied perfection, not only because of the stylized work but also because it is in the way of Yamamoto's subtle and on-point playing. Here's a quick rundown of the rest of the pieces: “Awash In The Midst Of An Angel's Tears” is a fascinating piece featuring furious clusters of notes by Yamamoto, ending with unison playing and singing of the theme. And now, for all of my whining about her performance on “Vermeer,” Conquest completely owns “Essence,” a short, bluesy piece that also allows for beautiful interplay between the players, especially between Parker and Yamamoto. Parker's rubbery bass line locks in with Eri's straight “block” style, creating a tongue-in-groove thing that holds the music together with subtlety and more than a little style. “Sweet Breeze” has me again wishing for a more untutored vocalist, which I think – again just a matter of personal taste – would be a better match for Parker's plaintive and direct lyrics. There are two versions of “Flower Song.” Take 2 is the one presented first; and it is split into three distinct parts, all played very freely. It is a brilliant piece with not one note out of place. On Take 1, Parker keeps meter time while Yamamoto plays simple chords, letting them hang with the damper pedal all the way down. The insanely gorgeous melody goes free after a couple of minutes, but this section isn't nearly as good as what wound up on Take 2. I can see why Take 1 was included – the straight melody is so beautiful – but it is ultimately superfluous to the masterful second take. Disc 2 was recorded in January 2012 in Paris & features Rob Brown (alto), Cooper-Moore (piano), Hamid Drake (percussion), and Klass Hekman (bass saxophone) in conjunction with Bill Cole (double-reeds), classically-trained Indian singer Sangeeta Bandyopadhyay, and Senegalese griot Mola Sylla on traditional African instrumentation. The work is titled Red Giraffe With Dreadlocks and was written specifically for this group of musicians. The composition opens with “Villages, Greetings & Prayer,” which features a short sitar loop and some didgeridoo drones in an India-meets-North Africa raga. The meeting of these traditional sounds is based on the theme of Universal Tonality. “We don't invent sounds, we are allowed to encounter them; we don't own them, they existed before we were born and will be here after we are gone” is how Parker himself explains it. The introductory piece seamlessly transforms into “Souks Have Fallen Like Rain,” on which spiritual siblings Parker and Drake lay down a hot groove over which Brown and Cooper-Moore vamp. Cole and Bandyopadhyay take turns wailing over the top, which eventually changes to a swinging flow – and allowing for some fine performances by Sylla and Bandyopadhyay. “The Giraffe Dances” suffers a bit from Drake being too far back from the microphones; but his performance radiates excitement, driving Brown and Cooper-Moore to wondrous heights as he breaks into a quick hard-bop tempo. Brown plays a theme around the nine minute mark that shines like the sun; and the other players appear when – and only when – they have something to add to the music. It is really at this point where the combination of these players and this music begins to gel in an unearthly, spiritual way. Cooper-Moore and Sylla stack beautiful melodies on top of one another on the transcendent “Tour Of The Flying Poem.” Bandyopadhyay drops an unexpectedly straight melody out of the English countryside onto Hekman and Cooper-Moore on “Children Drawing Water from The Well.” Parker, Hekman, and Cooper-Moore play further and further out as the music progresses, but never break pulse. Considering its manic swinging right out of the gate & incredibly strong theme, “Where Do You Send The Poem,” reminds me of a vintage Mingus composition. Sylla and Bandyopadhyay further explore the dynamics of the previous piece. Bandyopadhyay sounds a bit like Yoko Ono here, which hadn't occurred to me on any of the previous cuts at all. There are only two minor drawbacks to the entire work: the poor mic placement on the drums (as stated above) and the length of this last track. It doesn't seem to develop much over the duration and wears on this listener a bit. However, in terms of achieving a sense of universal tonal spirituality, and considering the genuine unity of so many disparate sonic palates, Red Giraffe With Dreadlocks is a barely flawed masterpiece. AUM saved the Monumental for last. Disc 3 contains Ceremonies For Those Of Us Who Are Still, Parker's first composition for symphony orchestra. It was commissioned by Poland's National Forum of Music and is performed here by the NFM Symphony Orchestra (with members of the NFM Choir), alongside Parker, Charles Gayle (! ), and Mike Reed. So how can you describe a jazz group working with a symphony orchestra without invoking Skies of America? You can't. It's the first thought I had as soon as the music began. Fortunately, I love Skies of America so it's a favorable comparison. On top of that, the sound Parker achieves in combining these elements is huge – and dynamic as hell. It's also an ideal soundtrack to a Midwestern winter. Some highlights: Parker drops the bass in favor of the ngoni (that harp-looking African instrument) to play against the orchestra on “Light Shimmering Across A Field Of Ice” and the result is beautiful. “Rise Up In Sound” gives a glimpse of what “Sun Ra Plays Skies Of America” would sound like – with Charles Gayle ripping up the horizon out front. Gayle also tears out in front of everyone on “Ritual” in a way that is completely stunning. It is a euphoric wash of sound that leaves me mesmerized every time. “Tea Leaves Of Triple Sadness” is the finest arrangement of the composition, combining all of the many separate elements perfectly. Flaws? Yeah, maybe a couple. “My Cup” and “Encore” both sound like they're trying too hard, which is completely out of character with everything else here. These pieces sound like warring factions in a battle of bombast, working against each other for the entire duration. I keep thinking either I'm not hearing these tracks correctly or I'm not understanding the intention of Mr. Parker. The set concludes with a trio improvisation by the Parker/Gayle/Reed trio that was originally played prior to the premiere of Ceremonies For Those Of Us Who Are Still. It clocks in at 25:25 and would make a fine release on its own. (A one-sided LP perhaps?) Good Lord, the way Parker and Reed lock down on this thing! It really is a monster. Available from Instant Jazz and the Downtown Music Gallery.